Hosts Brazil avoid heavyweights in group draw for 2019 tournament. 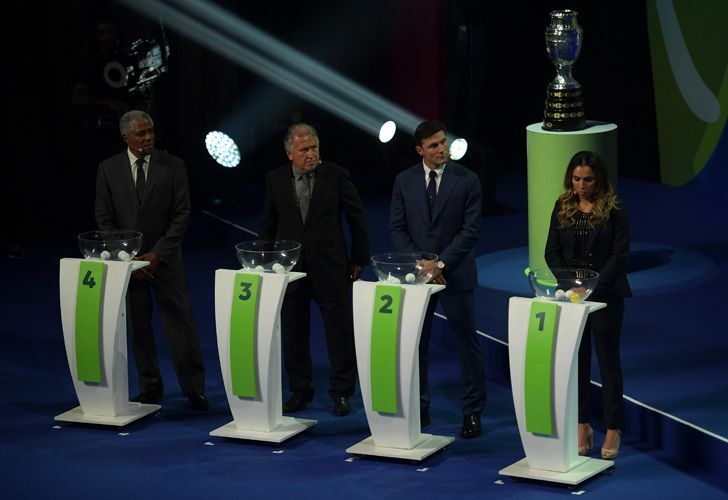 Hosts Brazil were handed a favourable group at the 2019 Copa América draw in Rio de Janeiro on Thursday night but Argentina landed a tough appointment with Colombia. Eight-time winners Brazil, the top seeds in Group A, were given a pool with minnows Bolivia, Venezuela and Peru. They will kick-off the tournament on June 14 against Bolivia in São Paulo. World Cup hosts Qatar, making their debut in the South American tournament as guests, were not treated kindly by the draw, landing the Albiceleste and Colombia in Group B, as well as Paraguay. Fellow Asians Japan, making their second appearance after a disappointing debut in 1999, also face a tough task to make it through Group C as they drew record 15-time champions Uruguay, holders Chile and Ecuador. Brazil, led by coach Tite, come into the tournament looking to make amends on home soil for their World Cup 2014 humiliation when Germany thrashed them 7-1 in the semi-finals. The hosts, who will have observed with concern a foot injury suffered by star player Neymar for his club Paris Saint-Germain on Wednesday, haven't won the Copa América since 2007 and last time out failed to even progress to the knock-out stages. It was a shock 1-0 defeat to Peru that sealed their fate in the Copa América Centenario in the United States three years ago, and they will again meet in the final pool encounter on June 22 in Sao Paulo. Argentina's recent major tournament history is of an even greater concern. Although they have reached four of the last five Copa América finals – losing to Chile in penalties in the last two – they haven't claimed any major honors since their success in 1993. They start their campaign on June 15 in Salvador against Colombia, who are ranked one place below them in the FIFA rankings and progressed a round further at last year's World Cup in Russia. Another concern for the Albiceleste is whether or not Lionel Messi will come back to the side for the tournament. He hasn't played for interim coach Lionel Scaloni who took over the reins after the team's World Cup debacle, missing six friendlies since then. The final will be played at Rio's iconic Maracanã stadium on July 7.